Omgomgomg, the big “V” day is tomorrow! It’s a day to celebrate Vests, Ventricles, and Vaccines! It’s time to Valorise your Varus Vassal! 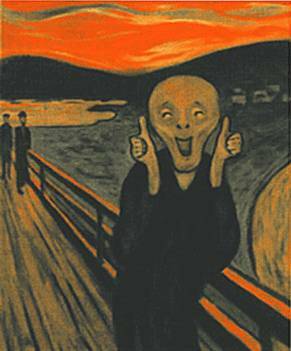 Go find a Vendible Vermillion Velocipede and Vesuviate with great Velocity into the Viridity of a distant View. At the Broken Spoke we don’t make special dispensation for Valentine’s Day, but we ARE open all weekend. There’s going to be a fun Sturmey Archer Hub Gears class on Sunday morning (sorry, it’s all sold out), and of course there will be biscuits! 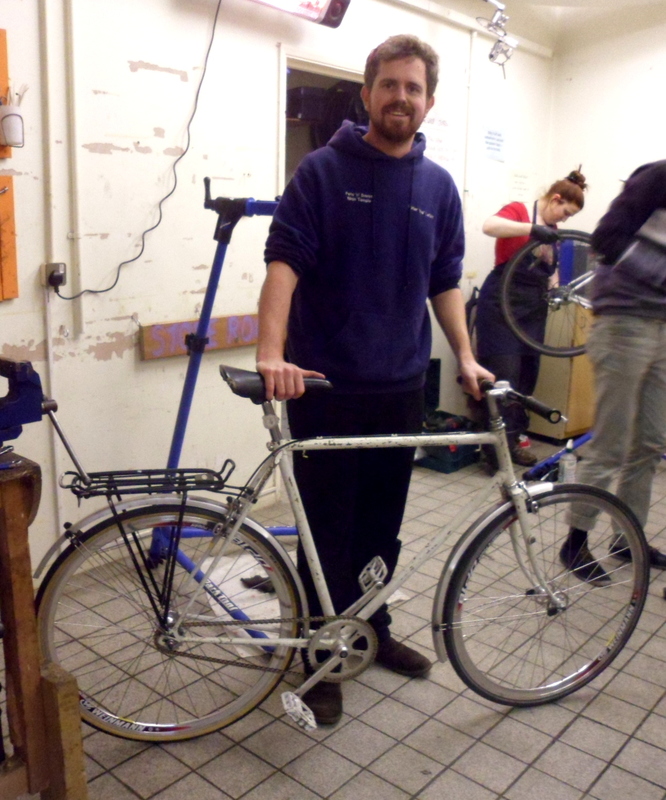 Coming up, we’ve just released some new dates for upcoming courses, we’ve restructured our Build-a-Bike programme, and we’re doing some really cool talks at Oxford University. 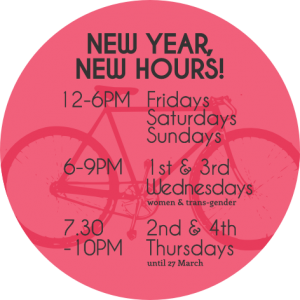 This month you might also catch us at the Oxford Brookes Sustainability Fair or being bike doctors at Unipart and Warneford Hospital! Stay dry out there folks, and see you in the workshop soon! On March 7 and 21 we’ll be speaking at Oxford University about cycling more efficiently and safely. The talks are free and open to everyone, and afterwards you can sign up for a practical one-on-one session with one of our certified cycle trainers. 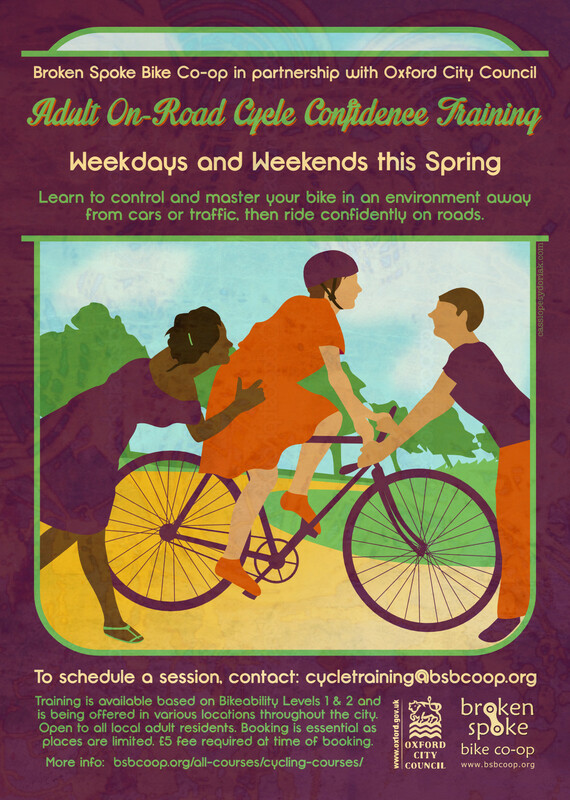 If you can’t make it but still want to learn to ride with confidence, lessons are only £5 through the end of March (or until we sell out) and can be booked online or by emailing cycletraining@bsbcoop.org. 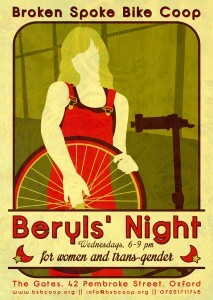 At Beryls’ Night next week we’ll be examining bottom brackets. Have wobbly pedals? Want to really get inside your bike? Join us taking apart the thing that holds it all together. The first week of March we’re excited to have an inspiring woman speaker wto celebrate International Women’s Day. Keep up-to-date with all Beryls’ Night news on our Facebook page. Step aside Justin Bieber, we released new courses that are going to be more popular than your latest album. You can sign up for everything by clicking here. We’ve redesigned our Build-a-Bike course to be more YOU-centric! Now, instead of a whopping 9-hour course on a Sunday, you can arrange 1-on-1 time to design and build that bike you’ve always dreamed of. 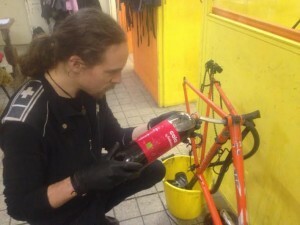 One of our mechanics will help you suss out what type of bike you want to build, navigate the confusing world of finding compatible components, and support you to build it up from scratch. Book online today and we’ll be in touch! Reclaim the Night – Women and Men: Celebrate Freedom! On the eve of International Women’s Day, all self-identifying women in Oxfordshire are invited to join the annual march through the city centre to Reclaim the Night, celebrating and declaring the right of all women to be free from violence and the threat of violence, and free to express ourselves and choose our sexuality. Men and women are invited to join us in a pre-march rally at East Oxford Community Centre with the Seagreen Singers, who will send us off with traditional, celebratory songs, and courage to face the night and take it back! Oxford Tri is a friendly, inclusive and very active triathlon club offering a wide range of coached and social training sessions throughout the year. We support and welcome members of all abiliies, from absolute beginners through to experienced national and international competitors in all forms and distances of the sport. Cyc-du-Soleil is an exciting new demonstration of sustainable technology in action. They harness renewable and creative energy to run high-quality low-carbon entertainment around the UK. 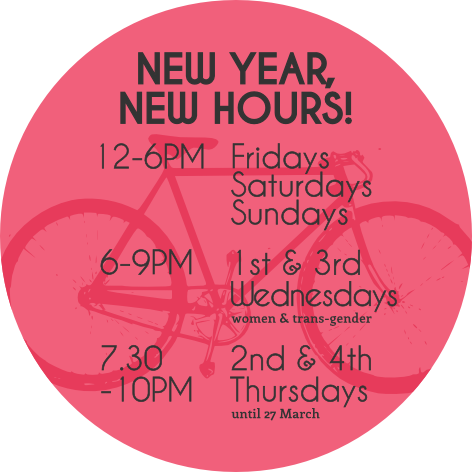 Soon they’ll have a new bike trailer/sound system, so stay “tuned”! The Human Search Engine is a unique and interactive experience, designed to challenge your preconceptions about mental health, stereotypes, and stigma. Give your questions about mental health to our Search Engineers, or pick a question like ‘what is mental health?’ from our Question Bank. Just like an internet search engine, our Search Engineers will then match your question with one of our many experts to give you an answer through a one-to-one conversation. The next event is 22 March at Arts at the Old Fire Station.